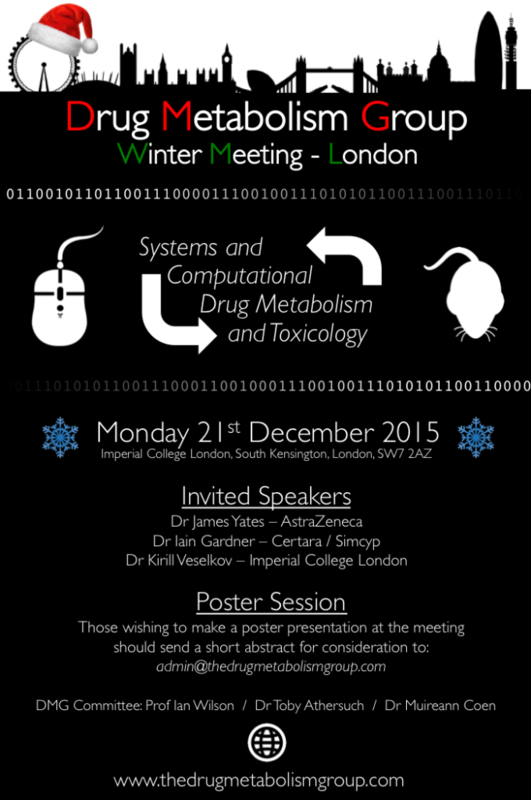 The DMG Winter Meeting will be held on Monday, 21st December 2015 at Imperial College London, UK. The meeting will focus on how systems and computational approaches are being used in drug metabolism and toxicological studies. The programme will comprise invited talks from researchers across industry and academia, poster presentations, and a Q+A session. Early-career researchers are encouraged to attend.Light refreshments will be provided, but attendees will need to arrange their own lunch; several cafes and restaurants are located nearby. The meeting is free to attend, but requires advance registration (tickets available from 16/09/2015). Further details of the meeting will be available on the site in due course.